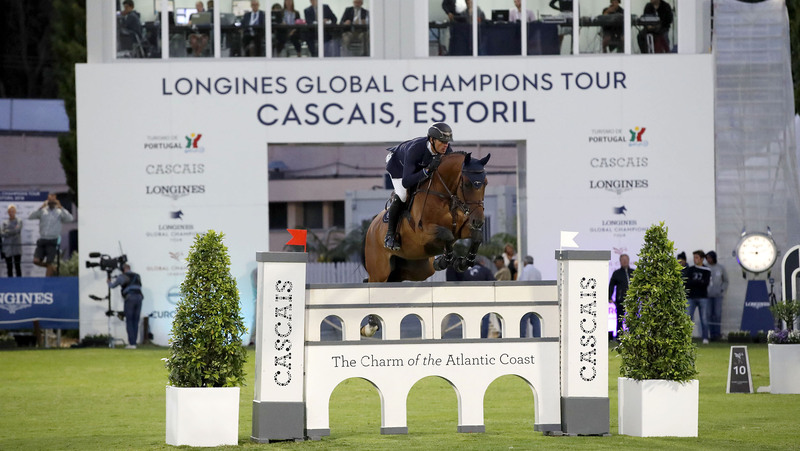 The first round of GCL Cascais, Estoril got off to a flying start with a record five teams scoring an impressive double clear. Paris Panthers’ formidable duo of Gregory Wathelet and Darragh Kenny pounced on pole position for the second time this season, with a phenomenally quick combined time shooting them to the top of the leaderboard. The Panthers lead the way into Saturday night’s showdown, with the teams starting in reverse order following today’s result. Slotting into second were the Scandinavian Vikings, with the overall ranking leaders London Knights taking third. Both Rome Gladiators and Montreal Diamonds also kept a clean score sheet, meaning all five could be within touch of the win as the Championship gallops to it’s midway point. Darragh Kenny spoke of the importance of collecting valuable scores towards the team’s bid for a place in the GC Play Offs; “We’re very happy, both horses jumped super. We need to have a good result this week.” His teammate Gregory Wathelet agreed, and spoke of the unusual five clears: “It’s difficult to explain as it looked not too difficult, but in the end there were only a few clears - so it was good for us!" Frank Rothenberger’s course made full use of the galloping grass arena, with long distances between the fences allowing the horses to pick up pace. Most of the riders attacked the course at speed, flying around as the floodlights shone on the picturesque venue. Gusty winds and the night sky gave tonight’s class a special feel, with the eighth event on the season calendar a firm favourite with riders and spectators alike. First to pave the way with a double clear were the Scandinavian Vikings, Christian Ahlmann lighting the way with Clintrexo Z before he was swiftly backed up by Leopold van Asten and VDL Groep Beauty. Quick to follow with a second double clear were the Paris Panthers after Darragh Kenny rode his relatively new mount Balou du Reventon masterfully around the arena, with Gregory Wathelet supporting him with an unbelievably fast round on Qualido - the Belgian rider almost five seconds faster than those already gone. Their combined time of 143.53s shot them to the top of the leaderboard with the rest of the teams still to come. London Knights had all the pressure on their shoulders, the ranking leaders looking to keep ahead of the pack with a strong result crucial as they look to Saturday’s showdown. The formidable duo of Nicola Philippaerts and Martin Fuchs proved just why they are such star strikers for the Knights - two speedy clears on their top horses H&M Harley vd Bisschop and Chaplin banked them a safe result and in prime position ahead of the GCL Cascais final. With so many double clears so far, the pressure was on, with any pole falling dropping teams right down the order. Four faults apiece for the Berlin Eagles’ Ludger Beerbaum and Christian Kukuk with Chiara and Limonchello NT put them out of the running for a top result today, and 10 faults for home city team Cascais Charms following just a time fault from Philip Houston and 9 from Luiz Felipe Cortizo Gonçalves De Azevedo Filho meant they would plummet down the standings. There was disappointment for Valkenswaard United after Alberto Zorzi took out the oxer in the first part of the double, Contanga just clipping the front bar to collect four faults. However Marcus Ehning pulled out all the stops with Funky Fred, the experienced combination keeping the team on their score of four and within a pole’s distance of rivals London Knights. Despite the many early clears the poles began to roll all across the field. St Tropez Pirates and Hamburg Giants all had scores to forget today, while Prague Lions, Miami Celtics, Shanghai Swans and Chantilly Pegasus all plummeted to the bottom half of the scoreboard. Montreal Diamonds pulled Mark McAuley off the bench for the first time this season, the Irish rider putting in a spectacular round with Miebello. He was backed up by Danielle Goldstein and her LGCT Grand Prix winning chestnut mare Lizziemary, putting the team right in the mix for a strong points haul on Saturday. Just one time fault for Doha Fursan Qatar’s Michael Whitaker and Cassionato kept the team at the sharp end of the grid, after a strong clear from teammate Sheikh Ali Bin Khalid Al Thani and First Devision. The final double clear came from Rome Gladiators after Marlon Zanotelli with Rock'n Roll Semilly and Abdel Saïd with Jumpy van de Hermitage pulled off a clean score for the team. But it would be the Panthers who keep their place at the top of the pack, leading the field ahead of Saturday’s GCL Final, held under the sparkling night lights in Cascais, Estoril.